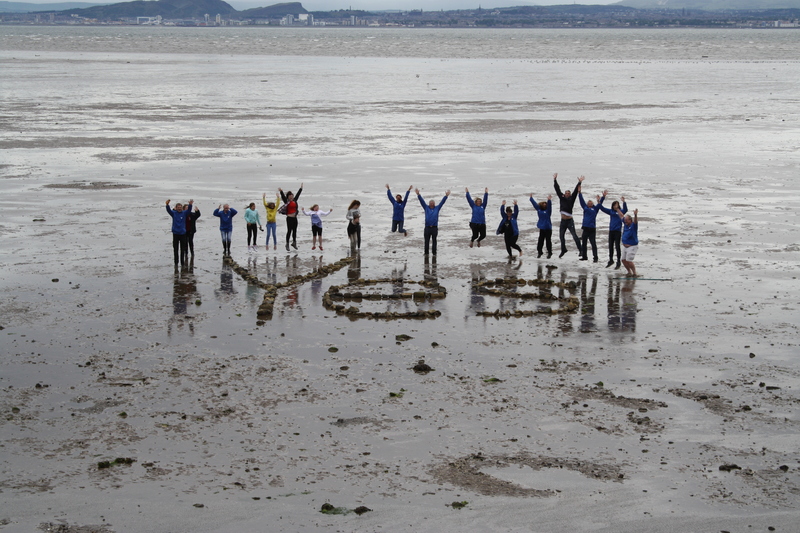 It’s a big Yes from Fife as a series of activities kick-off and the campaign gears-up to a whole new level. Supposedly Labour heartlands, Fife is turning to Yes fast. Here’s an outline of some of the activities and events coming up in the next few weeks. 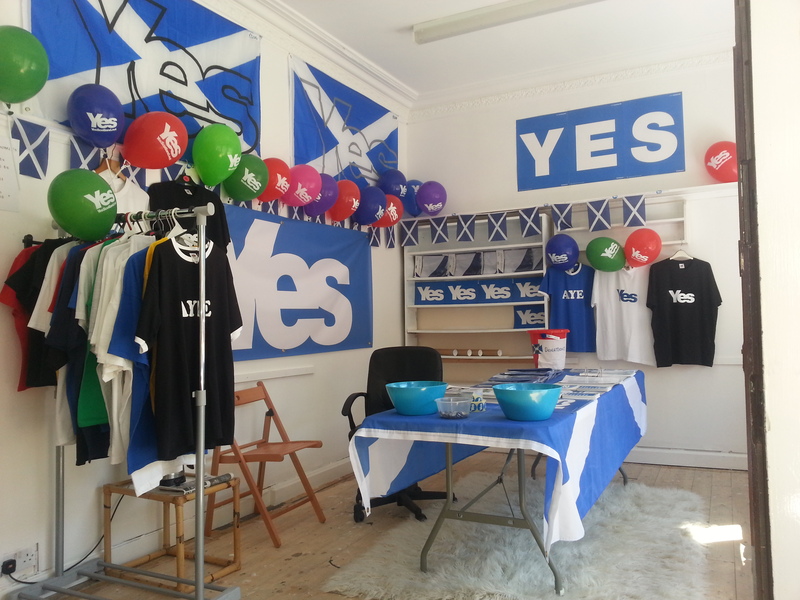 As well as a warm welcome, comfy sofas and free cup-cakes, visitors to the Yes shop can browse through the wide range of merchandise on sale.The shop is staffed entirely by local volunteers, is open from 11am-4pm Monday to Saturday and will remain in business until the big day on September 18. A Yes hub for Kirkcaldy is planned to open next week at 203 High Street Kirkcaldy next to where the McDonald’s used to be. Meanwhile there’s a queue to get inked-up in a competition to prove your Yesness. After the resounding success of the last mass Yes tattooing session in Kirkcaldy (covered by The Scotsman, The Sun, The Courier, The Fife Free Press and The Guardian), Spaghetti Tattoos (just down from Kirkcaldy Fire Station) is doing it all again. 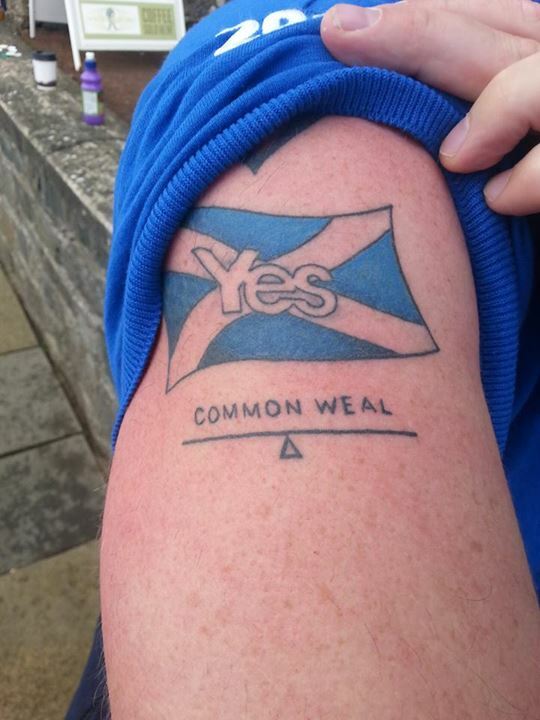 Tattoo artist and big Yes supporter Aphra Wilson will be open for business this Saturday from 10.30am, offering Yes tattoos in a choice of three designs, for a £2 donation to the Yes campaign. Just time to get one done before heading up to Kelty for Super Saturday? Kelty will be the focus of a major independence campaign event this weekend as the Yes Fife Super Saturday comes to town! The event aims to bring together hundreds of Yes supporters from across Fife to spread the word about independence in a particular part of the county.This Saturday’s campaign will focus on Kelty and has been jointly organised by Yes Kirkcaldy co-ordinator, Marie Penman, and local councillor Alie Bain. The previous three Super Saturdays in Fife were held in Dunfermline, were a big success. Super Saturday is open to anyone interested in joining the Yes campaign and starts at 11am on August 2 in the Moray Institute, 90-92 Main Street, Kelty, KY4 0AQ. Participants are advised to bring a clipboard and a packed lunch, with all other materials provided on the day. No previous canvassing experience is necessary. Organisers promise a friendly, informative day of fun and all those who attend will receive a free Yes wristband! Yes Fife is delighted to welcome Blair Jenkins to Kirkcaldy for the Radical Independence Campaigns second mass canvas on 6 August. Let’s ‘mobilise to transform Scotland’. Go here to see the RIC national site. 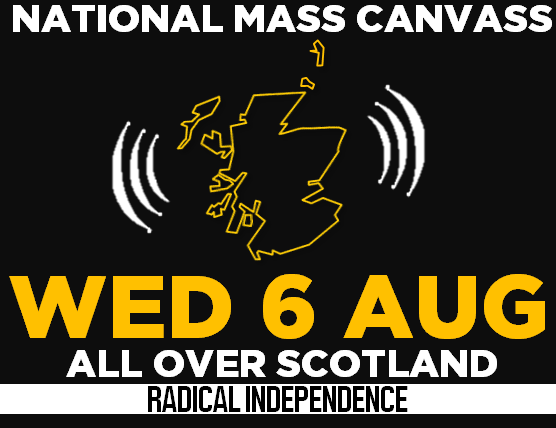 The canvass, which hopes to have volunteers out in every corner of Scotland, is the second in a series of national events organised by RIC, which targets areas with low turnouts in general elections. The Kirkcaldy group will be focusing on Templehall, a large council estate in the town, and hopes to knock on at least 600 doors in one evening. Blair Jenkins is coming along as part of a pre-arranged visit to Kirkcaldy. All are welcome to join in, even those who have never canvassed before, as full training will be given. Meet at the car park at Templehall shops at 6pm on Wednesday 6 August. Just a few weeks before the referendum, Nicola Sturgeon will be speaking at St Bryce Kirk, Kirkcaldy. Yes Kirkcaldy has already hosted Tariq Ali, Carolyn Leckie, Alan Bissett, Lesley Riddoch, Pat Kane, Mike Small, Ivan McKee, Natalie McGarry and others. It’s expected that Sturgeon will give her talk and then answer questions for over an hour. The event is aimed at undecided voters and local business. Yes Burntisland are screening the Scotland Yet, the crowd-funded documentary about the independence movement by Christopher Silver and Jack Foster. The filmmakers will be available for a Q&A after the film. Email Colin (ctevendale@msn.com) to reserve your seat.